Still working after 1 year! This sealer really works! Applied in the fall to new concrete driveway. Easy to apply. Initially the water beaded up but after a while it stopped beading. However, it continues to seal as is visible when it rains, my driveway concrete is white in appearance when all my neighbors driveways are dark gray which indicates that theirs have absorbed water. Expensive but worth it to keep water from freezing inside the concrete in winter and chipping the surface. And the SealGreen worked brilliantly! I had cleaned my driveway off with the Dustless glass blasting then had to wait awhile for some dry days to come. 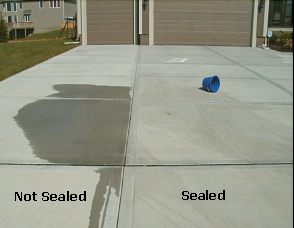 I pressure washed the driveway the day before and applied the sealer the next day when it had fully dried. The sealer was easy to apply with a sprayer. It covered the right square footage as advertised, sealed quickly with a light application. It rained today and the water beaded up and ran off. I will see how long this lasts.